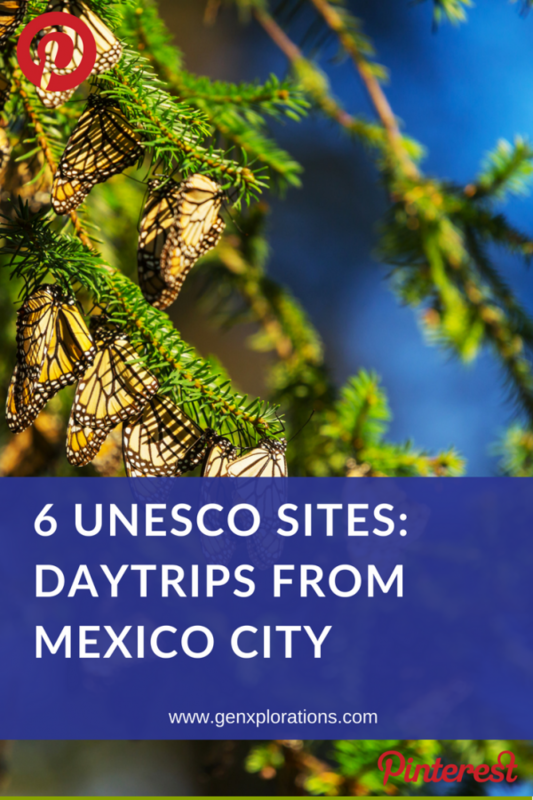 If eliminating UNESCO World Heritage Sites from your “Bucket list” is a priority, make Mexico City your “home base” and plan day-trips to nearby designees. Including Mexico City itself, you can reach nine others in 3-hours or less by car. With 34 UNESCO designations, Mexico ranks at #7 on the Top 10 List. Mexico has roughly the same number of sites as the US and Russia combined. Does this surprise you? It stunned me. The US and Russia are huge countries. For Mexico, a much smaller country, doubling the number of these two countries seems extraordinary. UNESCO designations come in distinct categories. 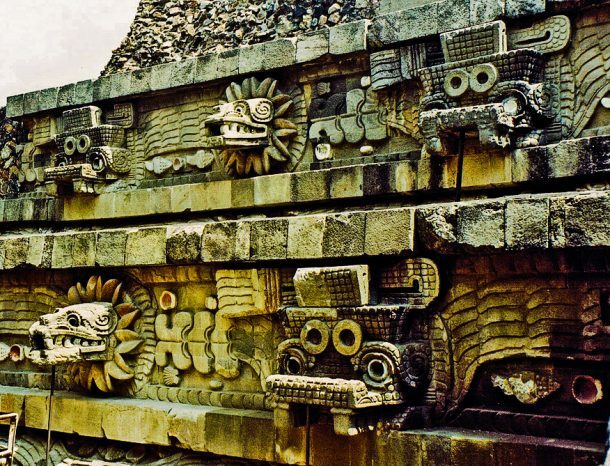 Mexico is home to 27 cultural sites/places, six natural and one mixed. Cultural sites consist of historically significant building and place, including entire towns. Natural sites are places such as archipelago, biospheres, and sanctuaries. Mexico City, as well as the city’s Xochimilco district, has earned UNESCO designations. In both areas, the past and the present are constantly and simultaneously observable. In the city center, you can find Aztec temples side-by-side with colonial architecture mixed with modern buildings. There is no better place to observe this than The Metropolitan Cathedral. Just steps from the Aztec Templo Mayor you will find this 16th-century church, a fusion of baroque, neoclassic, and Mexican architectural styles. This hulking cathedral, constructed over the course of three centuries dominates the Zocala (City Center). The original cathedral, erected from stones of the Templo Mayor was demolished to build the present-day church. As the primary temples of the Aztec people in their capital, Tenochtitlan, now Mexico City, Templo Mayor exemplifies this blending. Historians believe the temple was built in seven phases. The two stepped pyramids were dedicated to Huitzilopochtli, god of war, and Tlaloc, god of rain and agriculture. The temple was a focal point for the Aztec Religion and was believed to be the center of the universe. This would have been where the Aztecs, worshiped, made human sacrifices and held great festivals and feasts. The site remains a working archeological dig. Drive approximately 17 miles south of the city center to the Xochimilco District. 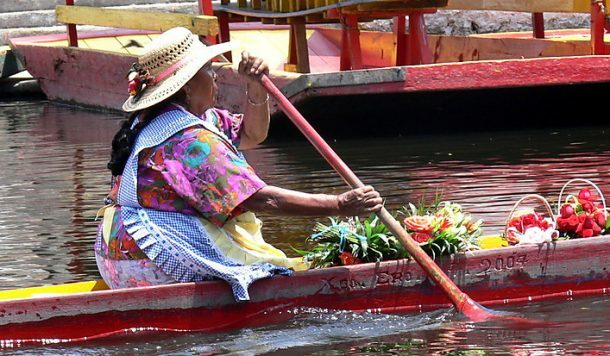 Ancient Aztec canals and chinampas (floating gardens) characterize this UNESCO Site. This thousand-years-old agricultural method of island plots of farmland between canals remains in use today. Traversing the canals in a brightly colored flat-bottom boat called a trajinera proves the best way to experience Xochimilco. Additionally, here you will find a colorful market brimming with fresh harvests from this ancient ecosystem. Located within Mexico City, the Central University Campus of the Universidad Nacional Autonoma de Mexico has earned the designation of UNESCO World Heritage Site in its own rite. Built in the late 1940s and early 1950s employing more than 60 architects, engineers, and artists, the campus establishes a unique example of 20th-century modernism. The campus integrates urbanism, architecture, engineering, landscape design and fine arts with aspects of local traditions founded in Mexico’s pre-Hispanic past. Moreover, the site exemplifies the social and cultural values of universal importance and is one of the most iconic modernizations in Latin America. Located approximately 3-hours northwest of Mexico City by car, in Guanajuato, is San Miguel de Allende. 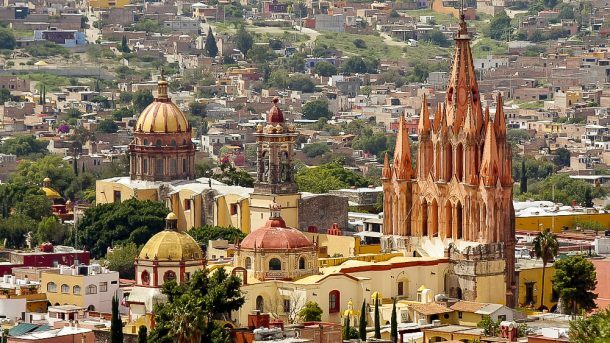 In addition to its recognition as a UNESCO city, Travel + Leisure named San Miguel de Allende the “Best City in the World,” 2017. Established in the 16th century, San Miguel acted as a protectorate of the Spanish Royal Route. Additionally, the city acted as a melting pot where Spaniards, Creoles, and Amerindians exchanged cultural influences. UNESCO considers the city an exceptional example of the blending of different architectural movements and styles based on a 16th-century urban design. However, not until the 18th century would it reach its cultural apex. At that time, many of the town’s outstanding religious and civic buildings were built in the style of the Mexican Baroque. Some of the city’s buildings are considered masterpieces of this style that evolved from Baroque to neoclassical through late 19th century Neo-Gothic. Only an hour northeast of Mexico City, you can explore Teotihuacan (Nahuatl: “The City of the Gods”), the most significant pre-Hispanic city in central Mexico. 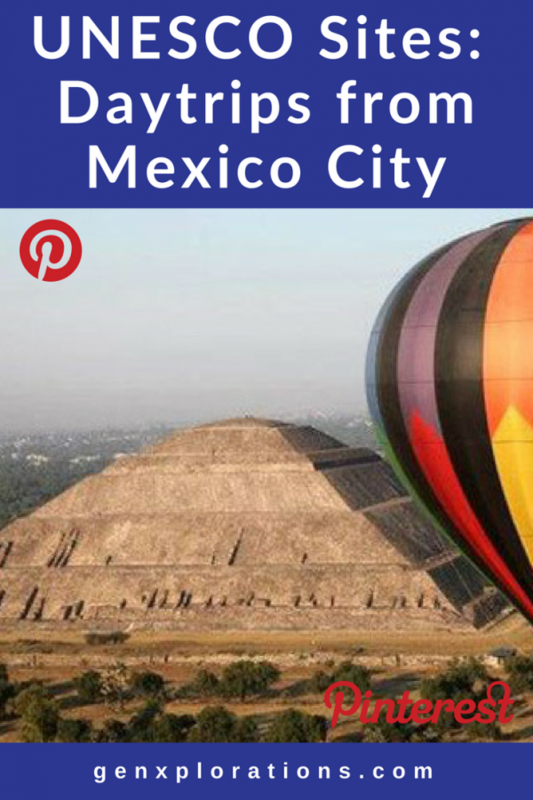 One of the best ways to witness this architectural and cultural site is from a hot air balloon. Soar above “the place where the gods were created.” The immense Avenue of the Dead built between the 1st and 7th centuries includes 2,000 residential apartment compounds, as well as, the enormous Pyramids of the Sun and Moon. Here you can walk the same sacred grounds where the Aztecs once worshiped. UNESCO considers the city a model of urbanization and large-scale planning, which greatly influenced the origins of contemporary and subsequent cultures. 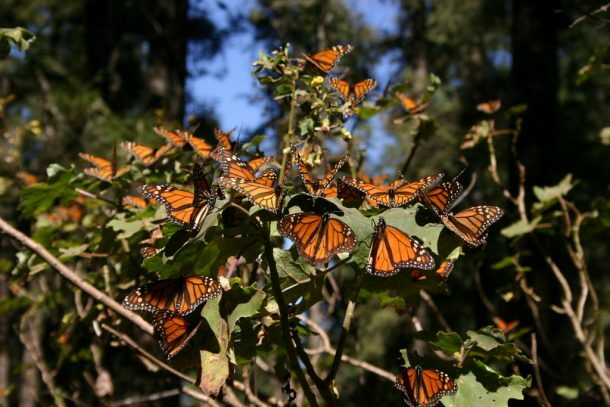 In the fall of each year, millions, if not billions of Monarch Butterflies make their way to the rugged, wooded mountains of Central Mexico. Here they will spend the winter months protected from the harsh elements of the north. Located in the mountains of Michoacán the 220 square miles reserve provides the perfect conditions for the butterflies to winter. The Monarchs travel 1250 to approximately 2800 miles to reach their winter destination. During their stay in Mexico, adults are courted and reproduced. Their offspring are the generation that will fly to the USA and Canada in March. Those born in the reserve will not return as their life cycle lasts only a few weeks. Inhabitants of the region believe that each butterfly represents the soul of a deceased loved one who comes to visit them. The reserve is open to visitors from November through March. Admittance costs approximately 35 pesos (just about $2 US at the current exchange rate). It is recommended that you visit with a specialized guide but groups larger than 20 persons are forbidden. A few things to know before you go include, no sound equipment (recorder, radio, etc.) may be used, remove all trash, wear comfortable shoes and removing butterflies, whether alive or dead is strictly forbidden. Situated at the foot of the Popocatepetl volcano, Puebla has preserved its many 16th and 17th century churches, chapels and monasteries. The fusion of European and American styles is unique to Puebla’s Baroque District. In Mexico, the Baroque style split into several sub-styles and techniques. “Estacado” Baroque, a purely decorative form did not employ any architectural features. The prominent features of this style were intricately detailed molded stucco covered in gold leaf or paint. This form reached its pinnacle in the 17th century in Puebla. A fine example of the style can be found in Puebla’s Chapel del Rosario. Another feature unique to Puebla “the true capital of Mexican Baroque” is the Talavera tile. These brightly colored hand-painted tiles adorn the facades of many of the local building. This feature has led to a distinctly personal and localized evolution of style, with a pronounced Indian flavor. You can observe the modern-day production of these exquisite tiles and other traditional Mexican pottery at the Talavera de la Reyna Factory located outside Puebla in nearby Cholula. While in Puebla visit Calle de los Dulce or “Sweet Street,” three blocks flanked by confectioners serving up sugary indulgences. Next, make your way to Barrio del Sapo or Frog Alley. 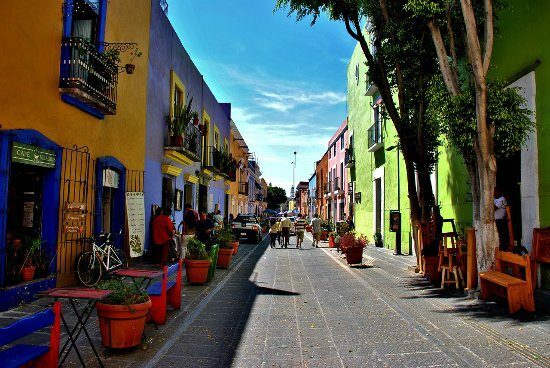 Despite the quirky name, this is a picture perfect, color-drenched colonial neighborhood chock full of antique stores, Mexican handicrafts and artist studios. Additionally, on the weekend, the “alley” and connecting plaza become a bustling open-air market. Bibliophiles will not want to miss Bibliotheca Palafoxiana, a bibliophile’s dream. Then head to the Museo Amparo (Cost: 70 pesos) with its vast collection of Mexican artifacts dating back to 2500 BCE and one of the finest collections of Mexican art in Latin America. Puebla is located approximately an hour and a half south of Mexico City. Many tour companies offer day trips to the region. If travel to any of these places interests you, you’re in luck. 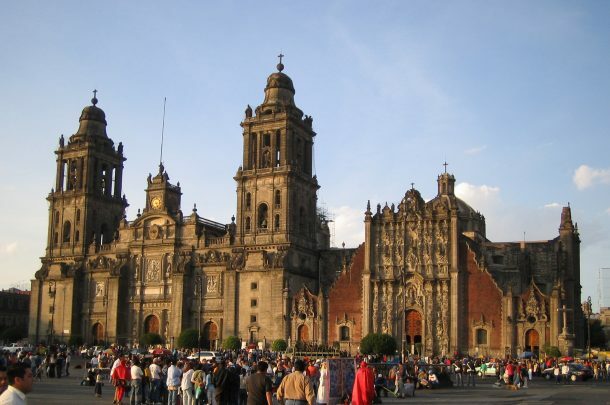 We have a trip scheduled to Mexico City, including Xochimilco, San Miguel, and Teotihuacan. Moreover, the trip is scheduled for the Day of the Dead holiday. Can you think of a better time to travel to Mexico?? Filed under Destinations, Trip Planning. Great post! Definitely surprised over how many UNESCO sights they have! I also was surprised by this. I had no idea there was so much to see in Mexico! I would especially enjoy seeing the butterflies. What a magical experience that had to be. Sadly, I’ve heard a lot of ‘Don’t go to Mexico. It is dangerous..” talk which scares people off from the safe and fantastIc areas of Mexico. You are right, there is a lot of “don’t go to Mexico talk.” I have been to Mexico 3 times in the past 2 years and am interested in retiring there. I wouldn’t be doing those things if I thought it were so dangerous. I live between Baltimore and Philadelphia. Baltimore had 343 homicides in 2017, Philadelphia 314. Both the highest on record for these cities. The murder rate in Baltimore is “roughly 56 killings per 100,000 people, whereas the entire country of Mexico has a “murder rate of 20.5 per 100,000 inhabitants.” However, we don’t hear, “don’t go to Baltimore or Philadelphia.” I think it is really important that we keep things in perspective when we hear these thing that discourage us from travelling to certain places.